12 Kaalsarp Yoga And Their Impacts In Life, Remedies of Kaalsarp yoga, Astrologer for kaalsarp yoga analysis and solutions, Astrologer For kundli reading for kaalsarp yoga and solutions. There is not one type of kaalsarp yoga present in horoscope but there are too many types of kalsarp yoga present in our horoscope which forms because of combination of planets in different houses and with different zodiac signs. All the different types of kaalsarp put different types of impacts in life. Here in this article i am going to describe the 12 different types of kaalsarp yoga. The above i have cleared about different types of kaalsarp yoga now i think it is not enough so now i am providing the details about how these kaalsarp yoga forms in horoscope and how it affects the life of a person. Hope this article will help you a lot to understand the impacts of kaalsarp in our life. When all the planets resides between Rahu and Ketu which are present in Lagna and 7th House of horoscope then anant kaalsarp yoga form in kundli. Person having this kaalsarp yoga faces a lots of problems in making own identity. Struggle do not leave the person whole the life. Marital life also affected badly. Mental problems also arises and person has to deal with new problems in day to day life. Instability in work also seen in this type persons life. 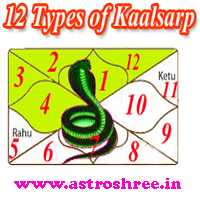 This kaalsarp yoga form in horoscope when all the planets resides between Rahu and Ketu which are present in 2nd house and 8th House. Financial problem is mainly seen with this type of persons life long. Defame and unwanted expenses moves along with the life. These types of problems makes the person short tempered. These types of person if born in financially sound family then also faces struggle for money. When rahu and ketu sits in 3rd and 9th house of birth chart and all the planets present in between them then vasuki kaalsarp form in horoscope. This yoga creates problems because of brothers and sisters. Person also cheated by friends. Problems persist in service and business. Fear of defame in society lives in the mind of person. Failure in partnership also seen. When rahu and ketu are present in 4th and 10th house and all the planets lies between them then this yoga forms in kundli. Due to this kaalsarp yoga happiness of life get disturbed. Problem related with mother arises. cheated by very close one. In spite of taking very efforts happiness will go ahead from the persons life. Problems in making stable career will also become a challenge. When rahu and ketu are present in 5th and 11th place then padma kalsarp yoga form in horoscope. Main problem arises in studies, progeny. Person suffers from hidden enemies. Fear of defame also create mental tension. Person doesn't get right life partner. Problem also comes in getting benefit. When rahu and ketu resides in 6th and 12th house and all the planets present in between them then this yoga form in horoscope. Chronic diseases are occur due to this yoga. Person lives a life in dilemma. Person has weak decisive power. Life is disturbed by enemies. Frustration, tension becomes a part of life. 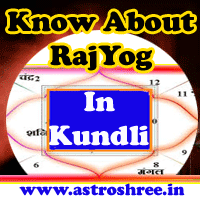 When rahu and ketu resides in 7th and 1st house of kundli then this yoga form in kundli. Because of this yoga marriage life become hell. Person become fail in love relations. Compromise is necessary for the person who has this kalsarp yoga in birth chart. When rahu and ketu resides in 8th and 2nd house of kundli and all planets present in between then this yoga form in birth chart. Accidents happens due to this yoga. Death due to unwanted reasons also takes place. Sexual diseases also creates problems. If some one borrow money then it becomes difficult to get back. Too much struggle to maintain the life. When rahu and ketu present in 9th and 3rd house of horoscope then this yoga form. The main problem is in bhaagyoday. Obstacles in career and personal growth. Instability becomes the routine life long. In every effort to make our life bright become fail. When rahu and ketu present in 10th and 4th house of kundli then this yoga form. Person have conflicts with the higher authorities. Career and personal life both faces problems a lot due to this ghatak kalsarp yoga. Due to frustration and no support from destiny many types of mental and physical problems arises. When rahu and ketu present in 11th and 5th house of kundli then this yoga form in birth chart. Problems comes in studies,progeny, earning sources. Conflicts among the brothers and uncles. Children become ill because of this kalsarp yoga. When rahu and ketu present in 12th and 6th place and rest of the planets present in between then sheshnaag kaalsarp yoga form. Person become frustrate due to wandering job or nature. Insomnia also arise due to this. Mysterious types of expenses happens. Whole life person faces problems due to hidden enemies. Heavy debt ruins the life. It is my personal request to not reach at any decision because some times due to degree and positions of other planets results varies. The main thing is that kaalsarp yoga arise struggle in life and so it is very necessary to take some good steps to minimize the impacts of this yoga. Perfect reading of horoscope for Kaalsarp yoga analysis from ASTROLOGER. On-line consultancy for kaalsarp yoga from one of the FAMOUS ASTROLOGER. Know the impacts of KALSARP YOGA in your life through minute analysis of horoscope or kundli from one of the FAMOUS, TRUSTED AND BEST ASTROLOGER. Ask questions from ASTROLOGER regarding KALSARP YOGA. Get best remedies of Kalsarp Yoga problems from Indian astrologer. KALSARP dosh nivaran mantra, spell to minimize the impacts of kaalsarp yoga, Pooja to minimize the impacts of kalsarp yoga. ASTROLOGER FOR SOLUTIONS OF ALL PROBLEMS through astrology and occult sciences. Read FREE articles on kaalsarp yoga.